BMW ICOM firmware has been updated at CnAutotool. Here, the engineer offers the icom firmware update file and instruction to help you update ICOM A1/ A2 system image to version 01.25.02 & application image to version 01.40.05. What do you need when doing ICOM firmware update? Why to update ICOM firmware to 1.25.02 1.40.05? For the newest Rheingold/ ista+ 2016, it is a must to update the BMW diagnostic tool firmware to the latest; otherwise, it would fail to diagnosis or do programming on BMW vehicles. How to update ICOM A A2 system 01.25.02 application 01.40.05? 1.Connect ICOM A1 / ICOM A2 to PC via wired network connection. Connect ICOM A1 / ICOM A2 emulator to the vehicle or power on the emulator via 12V power adapter. 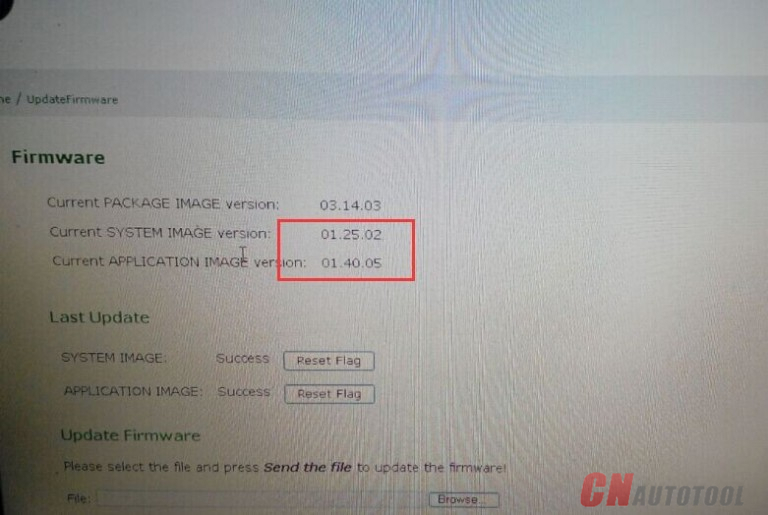 3.Click “Update Firmware“, to get the ICOM firmware version. 4.Select file “ICOM-BootImage-01-25-02.bin”, to set image type as SYSTEM, then click “Send the file”. 5.Prompt: Write the image file to the flash? Select Yes, and the light on ICOM mux will turn red. 6 .Prompt: The SYSTEM IMAGE update was successful. 7. Select file “ICOM-ApplicationImage-01-40-05.bin”, to set image type as APPLICATION, and then click “Send the file”. 8. Prompt: Write the image file to the flash? Select Yes, and the light on BMW ICOM A+B+C mux will turn red for the second time. 9 .When all is ok, click “reboot“. Two update files are available. Use the small-size first, then the big-size. When using the small-size file, select SYSTEM. When using the big-size file, select APPLICATION.